You are viewing this Brand New Officially Licensed NFL Football Fan Apparel Item. 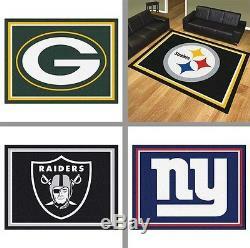 Choose Your NFL Team 8 x 10' Ultra Plush Carpet Area Rug Floor Mat. Proudly support your favorite Team with this high quality stylish Extra Large Size Plush Area Rug in Team Colors with Logo by Fan Mats. View All Mats & Rugs. Fan Mats Complete Line of Products Video Introduction. (Item is Made to Order). Show some pride and support of your favorite NFL Team by decorating any large room floor with this stylish and sporty 8' x 10' Decorative Ultra Plush Area Rug Mat! Add some style to your recreation sports room, man cave, office, living room, bedroom, den, or any where you want to display your team spirit. This Extra Large Area Rug is an Ultra Plush Nylon Carpet with a 32oz face weight; which is a lot thicker then the other large-size floor mats from Fan Mats! Chromojet printed in official Team Colors with a stylish Team Logo Design as shown. 100% Nylon Carpet with Non-Skid Latex Backing that is perfect for carpet or hard floors. 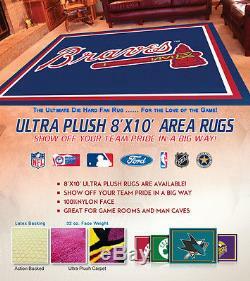 High quality, heavy, and durable 8x10 Area Rug that is made by Fan Mats. Approximately 8' x 10' - (87" x 117") in size with serged stitch edging. This indoor floor mat is the largest size plush area rug series available! Officially Licensed by the NFL. Each product is produced in a 200,000+ sq. Made of the highest quality, high luster nylon yarn with 32oz face weight. These mats are chromojet printed, allowing for unique, full penetration of the color down the entire tuft of yarn. A full-time team of ISO professionals and Quality Inspectors ensure that every mat produced meets the company's highest standards. The result is a superior quality, highly attractive mat that any true fan would want to own. Sizes are approximate and subject to small variations due to the manufacturing process. Images are computer generated representations of the product and subject to minor variations. We offer the largest selection of team sports area rug floor mats which are available in many SIZES and STYLES! Please search by the team category or use our search feature to find more of these awesome area rugs and floor mats. Product Size: Approx: 8' x 10' - (87"x117") Product Color: Team Colors Product Material: 100% Nylon Carpet with Latex backing. NFL SHOP AT LORRINA'S HOT DEALS. BEST PRICES ON THE NET - BLOW OUT SALE - WHOLESALE PRICING. Visit Our Other Store Items at Lorrina's Hot Deals. Please visit their website to read about important information regarding receiving package. You may or may not have to sign for your package. That is determined by the driver if they can leave it at your door or in a secure place. (Item is Made to Order) All products from Fan Mats are MADE TO ORDER! This is because they offer so many teams and styles. NO PO BOX Addesses Allowed! Thank you for your time and business! When your replacement product(s) are reshipped to you, there is no extra cost to you and a return call tag label will be provided for returning the damaged or defective item. We want your shopping experience with us to be a "5 STAR" experience. Once your item(s) arrive, please make sure that your order is correct, intact, and complete. Upon doing this, you will also be able to rate on a scale of 1 - 5 in the four categories. We will make every effort to make your experience top notch! Powered by SixBit's eCommerce Solution. The item "Choose Your NFL Team 8 x 10' Ultra Plush Carpet Area Rug Floor Mat by Fan Mats" is in sale since Saturday, October 10, 2015. This item is in the category "Sports Mem, Cards & Fan Shop\Fan Apparel & Souvenirs\Football-NFL". The seller is "lorrinashotdeals" and is located in Suwanee, Georgia.